This interesting surname is of Anglo-Saxon origin, and is a topographical name for "someone who lived near a hazel tree or grove". The derivation is from the Olde English pre 7th Century "haesel", hazel. Topographical surnames were among the earliest created, since both natural and man-made features in the landscape provided easily recognisable distinguishing names in the small communities of the Middle Ages. In some instances the surname may be locational from Hessel in the East Riding of Yorkshire, recorded as "Hase" in the Domesday Book of 1086, and in the West Riding of Yorkshire, recorded as "Hasele" in the Domesday Book, which also derive from the Olde English "haesel"; hence, "hazel grove". Gamel Hesel is noted in the 1203 Pipe Rolls of Lincolnshire, and Henry de Hessell is listed in the Register of the Freemen of the City of York. 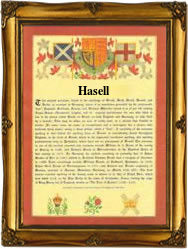 In the modern idiom the surname can be found as Hazel, Hazell, Hasel, Hasell, Haisell, Heazel, Heazell and Hessel. Thomas Hasell married Katheren Richardson on November 28th 1562, at St. Giles' Cripplegate, London. On March 28th 1678, a ticket was granted to William Hasell, to sail from the Barbadoes to Bristol, aboard the ship, the "Olliue Tree". A Coat of Arms granted to the family depicts three silver crescents on a blue fesse between three hazel slips proper on a gold shield, the Crest being a squirrel sejant cracking a nut between two oak branches all proper. The first recorded spelling of the family name is shown to be that of Alured del Hesel, Worcestershire, which was dated 1182, in the "Studies on Middle English Local Surnames", during the reign of King Henry 11, known as "The Builder of Churches", 1154 - 1189. Surnames became necessary when governments introduced personal taxation. In England this was known as Poll Tax. Throughout the centuries, surnames in every country have continued to "develop" often leading to astonishing variants of the original spelling.